A responsive header adjusts automatically, depending on the screen size. In Website Builder you can use the Strip component for this. 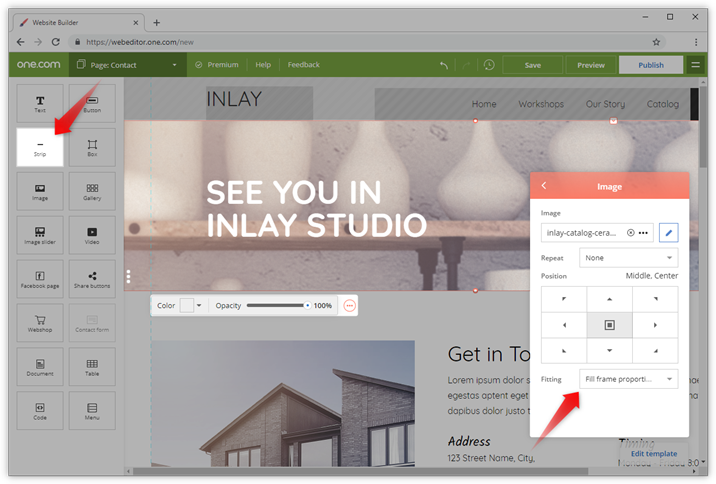 Open the page where you want to add the header in Website Builder. Drag the Strip component into your workspace. Click the Edit strip button that appears when you click on the component. In the floating menu that appears, click on the Image section to add an image to your header. Click Add image to select one from My images, or upload a new one. Select Fill frame proportionally under Fitting. Adjust other settings like position, opacity, colour and borders. Save and publish to make your changes visible on your website. It's also possible to add a header with a solid colour or gradient, instead of an image. Tip: Do you need inspiration to find the right image? Check Free from One.com and search through more than 20.000 stock images.